In offering the world a glimpse of the phenomenal life of Nelson Mandela, director Justin Chadwick wisely relied on the words of the man himself, adapting Mandela’s autobiography for his film. Chadwick’s vision is grand, the performances strong, and the story not only compelling, but tragically timely. 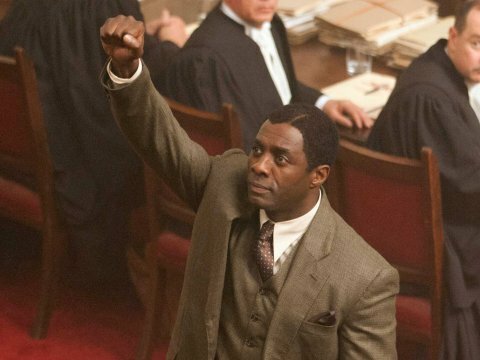 So why does Mandela: Long Walk to Freedom feel unsatisfying? The fault is certainly not with the film’s leads. Idris Elba’s performance is alive with exploration. You can see his temperament adapt and change along with Mandela’s experiences. Elba finds a depth of character not provided on the page of William Nicholson’s screenplay, and his maturing characterization allows the film, which suffers from Cliffs Note-idis, a bit of depth it would otherwise lack. Likewise, Naomie Harris deftly handles the far more radical change in character demanded from a depiction of Winnie Mandela. From idealist to radical, Harris nails the metamorphosis, but because of the way we simply check in with Winnie every few years, the role lacks much opportunity for nuance. The film simply covers too much ground. It does so with sumptuous set design, a convincing ensemble, and a directorial hand that respects the source material enough to uncover flaws as well as triumph. But what Chadwick needed to do was narrow his vision. Long Walk to Freedom offers perhaps the most compelling depiction of the relationship between Nelson and Winnie Mandela yet brought to the screen, aided by performances that ache with tenderness. Elba commands the screen with a smoldering charisma worthy of a portrait of Mandela, while Harris treats Winnie Mandela with respect and compassion without sugar coating her behavior. Had Chadwick and Nicholson plumbed this rich relationship a bit more, or simply chosen any smaller slice of Mandela’s life to examine more fully, their film – with the gifts it has to offer – could have become a magnificent memorial for mourners and a fascinating introduction for those only drawn to the story of the leader because of his recent passing. Instead, the filmmakers settled for a superficial treatment, hitting all the high points without examining the depth or complexity of anything. It’s an unfortunate compromise, both because all the needed ingredients were in place for a truly grand biopic, and because Mandela deserved a more memorable send off.